When workers want to get the best of working projects and employers want to award their work to the most efficient workers and entities, both of them need to find the bridge which can build faith and trust between both of them. Rent a Coder is that bridge which provides safe and secure environment for both the parties. It is a globally recognized software development marketplace. Rent A Coder (vWorker) brings programmers (or coders) and buyers together at the virtual market place which is now the biggest platform offering immense potential to be tapped on either side. Its strength lies in providing professional coding (or software programming) professionals for both long and short term projects to the developers which, in turn get their work done by best of the talents. It is actually its website,www.rent-acoder.com, which is the excellent marketplace platform. It has all the information which is helpful for both the workers and employers. Both the parties, or sometimes third parties, are required to register at its official website for proceeding in their respective purposes. The website provides safe and transparent bidding system while maintaining a higher level of security and privacy. Its website also provides a forum where the user is connected to the large community having same intentions. Beside this, the website is presented in an extremely attractive design and user friendly content placement method. You can also go through the testimonials of its services made by the actual users at its office website. Rent a Coder is the brain child of a US based software developer who presented this excellent marketplace for providing safe and secure environment to both coders and employers. He is the CEO of Rent-a-Coder (Now vWorker) and its subsidiary Exhedra solutions. He has 15 years of experience in varied categories of IT industry like Software development, team leading, independent consulting as well as programming architecture. The idea of creating Rent A Coder platform is driven by experiencing difficulties to find the coders for his own website. At present he has been the leading the highly respected enterprise vWorker (and now Rent A Coder services have been integrated into it). His company has been figured as ‘One-of-The-100-Most-Brilliant-Enterprises’ by prestigious magazine Entrepreneur. Initially, Rent a Coder was meant for finding software coders only but now under its name, workers and employers can look for content writing, translating, proofreading and other services like web designing from across the globe. • Free of cost registration is provided for the users who wish to register at its site. • Rent-A-Coder charges only after you have been awarded with a project. • Employers do not require to pay for listing their projects. • Employers get to tap the best talent as hundreds of people compete for a single project from across the world, so employers would get their work done from the best of the brains. It is the biggest pro that the bidding quotes are not disclosed by the company and it maintains healthy competition so that both the parties feel happy and satisfied. • There is not much on this front to discuss about. As Rent A Coder works only as a mediator facilitating the employers finding the most competent, efficient and reliable workers for finishing their projects. • One note of caution is that employers need to check the ratings of workers. • Rent-A-Coder is said to have higher charges as commission which go up to 15% of project value. It is more by a margin of 5-10% than other similar market place. • Strict discipline guidelines may prove to be a negative factor for flexibility among the Employer-Worker community. At Rent-A-Coder, employers from all across the world post their projects. So, you can look into the deals being offered by the employer of a particular country. For example, if you are good at US English Writing and wish to grab content writing projects, you can seek the projects listed by US Employers only. Those willing to do Australian or UK projects can explore opportunities in their respective categories. Similar kind of workers looking for the same type of work competes for a single project. For instance, if you are an employer and have been looking for a coder to design your website, those programmers bidding for the project are from different countries say Australia, India, UK and many other countries. Rent a coder facilitates healthy competition among the workers by enabling transparency. Workers start working on the project only when the amount of the project value has been escrowed to the third party account. RAC lets you know when it is done. Once the projects are approved by the clients, the payment is credited to the RAC account of the worker. It uses Escrow Payment System. Employers can specify their choice of ‘open bidding’ where all interested workers are allowed to bid or else they can also choose only ‘selected workers’ bidding for their projects. They can even invite only one freelance worker with whom it has worked earlier. Rent-A-Coder has its foundation based on the principles of Safety, Security and Reliability. It does so by offering worker’s guarantee, Guarantee to the third party and website security. The workers are paid for the project they work on as soon as it is accepted by the employers. Rant-A-Coder assures its clients of guaranteed payment if the work has been completed on time and the work delivered is matching the industry standards. 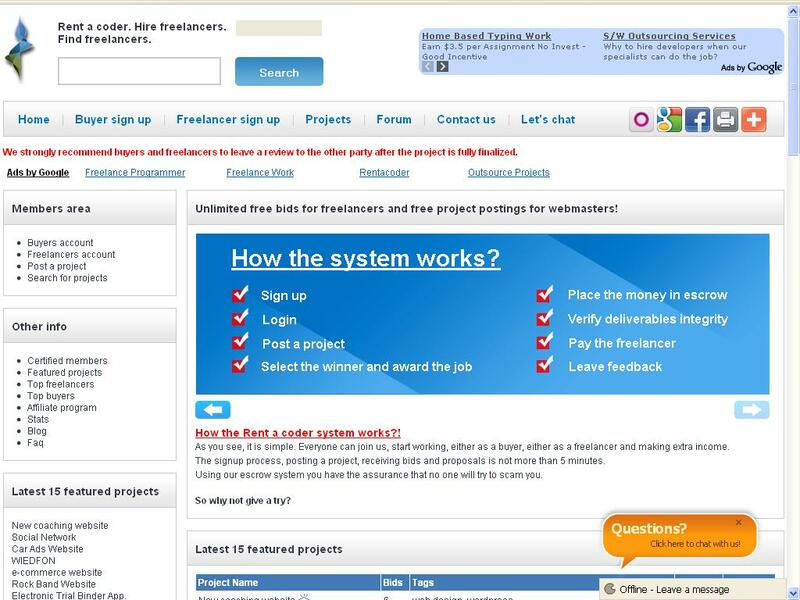 Employers posting their projects on rentacoder.com are given assurance of money back guarantee in case the work delivered by the workers does not meet the expectations. Rent A Coder can ask the worker or coder to deposit certain security money in the account. This money is handed over to the employer if rubbish work has been delivered by the coder. It uses Thawte Technology for getting strong security assurance to the website. SSL (Secure Sockets Layer) Encryption ensures further protection. Clustered DNS Servers: In case one server has gone down, another server would start functioning instantly. If physical hardware has failed for whatever reason, another server picks up automatically. It also awards excellent benefits to people who refer or recommend using its site to workers and employers. It pays the amount every time more business is done by the users. So, even if you are not the active user of the website you stand a good chance to earn good income. It’s easy to understand how this whole system of marketplace works. It basically works through the following three steps. Employers have to go through the quick registration process and after registration is confirmed, they can post the projects for free. Soon after the project is listed on the website, workers start bidding with their prices. Employers after receiving the bids can carry out reviews and can award the project to those bidding for the least. Employers can award the project to the suitable party they feel are satisfied with. Once the agreements are finished and amount has been escrowed, Rent A Coder suggests the workers to work on the project. 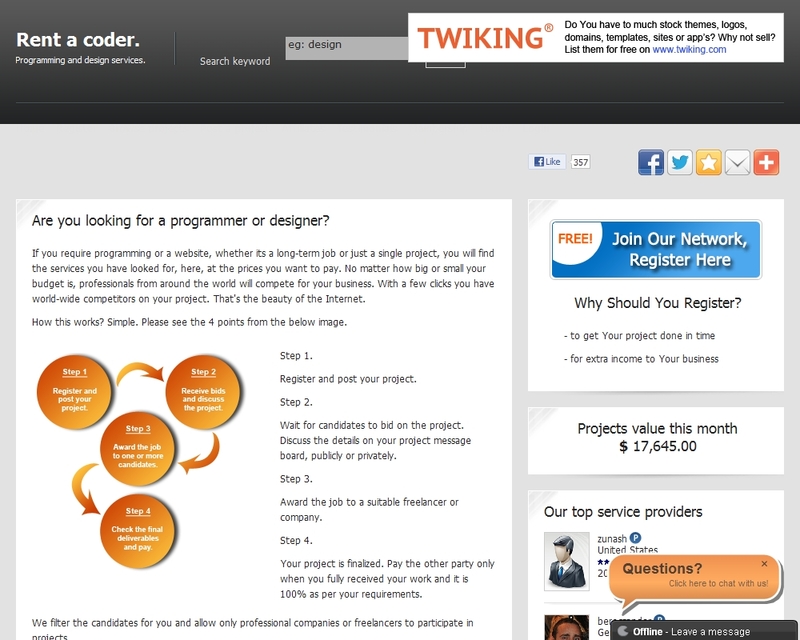 Registering, Joining, and listing of projects is free of cost at Rent A Coder. It charges the mediating fee ranging from 6-15% of project value. Rent-A-Coder on the basis of its strong technological base and trust of its users has carved out its cult identity among the buyers and sellers community. It has been striding towards newer dimensions steadily. However, a few marketplaces like oDesk, Get A Coder, Top Coder etc. keep posing challenges to its name and reputation. Rent A Coder may be getting serious challenges from its peers yet it has an edge among various areas. For instance, Rent A Coder’s standard services of pay-for-deliverable like triple point money back guarantee, website security, payment guarantee for workers are offered at no additional cost. It also offers additional benefits of free arbitration service and safety protections. On the other hand its rivals oDesk’s and Scriptlance’s standard services do not provide money back or safety guarantee. They don’t have arbitration benefits either. So, Rent A Coder is the perfect solution for those looking for work as well as for workers. Buyers (coders) can expect the best of the projects worth hundreds of dollar being listed by the employers. They get excellent opportunity to choose the type of projects they want to work on. Similarly employers get their work done on time. So, employers and workers can both expect the best results. Rent A Coder is a fantastic virtual marketplace for employers as well as for talented freelancer coders. Both of them get guaranteed protections and are thus are saved from being cheated. Rent A Coder saves them from any fraud. Rating systems of the website help the employers to get credibility about the workers. As long as good work is delivered by the workers they have promising opportunities ahead. There’s no investment actually. You just need to commit pay only after your objectives are met. However, when both workers and employers get satisfaction from each other it may charge some percentage of the total. Workers get huge returns in the sense of hefty cash they earn from various projects and simultaneously employers are happy that their projects are done efficiently on time.